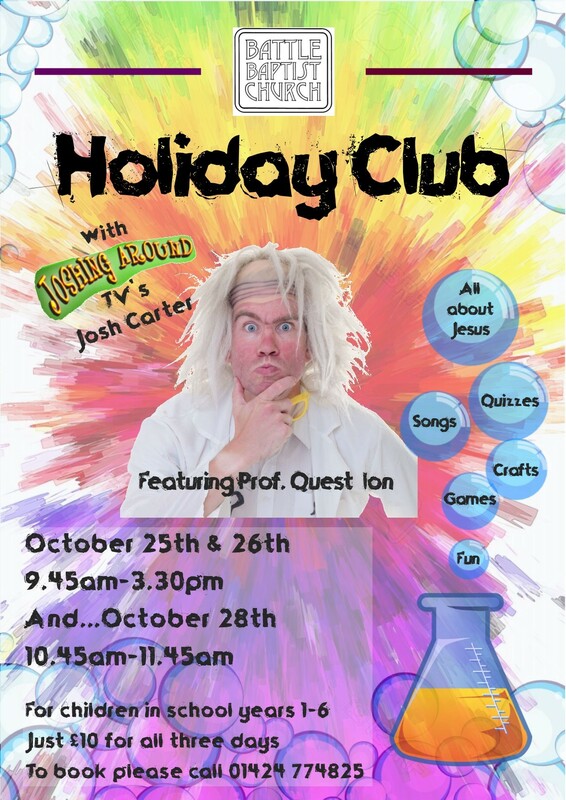 In the October half term, we usually host a fun-filled holiday club for primary school aged children. Last year’s application form is below to give you an idea of what to expect: watch this space for this year’s Holiday Club! We will accept responsibility for the safety of your children, but it is your responsibility to arrange for your children to be delivered and collected promptly. We will provide drinks and biscuits during the morning. Each day the children should wear clothes suitable for games and crafts. We are unable to send children home alone without prior written consent. Numbers of places available are limited so please complete the registration form and return it to the Church Office in Mount Street as soon as possible. Cheques (payable to Battle Baptist Church) or cash, with registration form, in a named envelope please. We may take photos of the events for Church publicity. If you have any objections to your children being photographed, please tell one of the leaders. If you wish to ask further questions or need help then please phone or email us. Will your child make his/her own way home? In the unlikely event of illness or accident, I give my permission for medical treatment to be administered where considered necessary by the nominated first aider of the holiday club, or by suitably qualified medical practitioners. Should my child require emergency hospital treatment, I authorise an adult leader to sign on my behalf any written form of consent required by the hospital if I cannot be contacted. However, I understand that every effort will be made to contact me as soon as possible. I also confirm that the above details are correct to the best of my knowledge. We are collecting this information to enable the church to run the children’s/youth activity safely and ensure we can contact you (or other nominated adult) in case of an emergency. The information your supply will be held securely in the church office. The forms will be destroyed unless you have ticked the box asking us to keep you informed about future activities we think your child might be interested in attending. You have the right to ask to be removed from this circulation list at any time. If you are concerned about the way your information is being handled please speak to our Data Protection Officer.